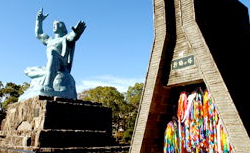 Nagasaki Peace Park was created to represent the wish for world peace. Explore the park (near the center of the atomic explosion), which includes remnants of Urakami Cathedral. The Peace Park was not as expected but the other parts of the tour were ok. It was a lovely day, the cherry blossom was flowering and we had an interesting guide. The guide spoke excellent English and gave us plenty of time to spend in the museum and the park. The guide spoke excellent English and gave us plenty of time to spend in the museum and the park. Avery emotional visit. Peace memorial park was very thought provoking. Peace memorial park was very thought provoking. Time to reflect on past events. Enjoyed the memorials at Peace Park. Enjoyed the memorials at Peace Park. The Kamikaze museum was interesting but no english signage anywhere. The Nagasaki Peace Park and Atomic Bomb Museum are easily accessible by tram. This was very moving and well worth visiting. Very moving and interesting place to visit, easy to get around using Trams. Statues from around the world supporting the Japanese people. Very moving. The sculptures from around the world are lovely as are the flowers. Everyone is quiet and respectful, as they should be. There are many opportunities to take pictures. Late into port meant that it was getting dark by the time we visited. Late into port meant that it was getting dark by the time we visited. Beatiful monuments donated from around the world.